Never underestimate the power of a good kebab. Regular readers here may have noticed I don’t eat a lot of meat, I’m not a vegetarian and I eat plenty of seafood, but meat just isn’t to my taste. I’d probably forget about it completely if it weren’t for other people reminding me and a once-a-year hankering for a BLT. But while living in Damascus, there was one meat dish I could always be counted on partaking in, one carnivorous dish I truly loved. 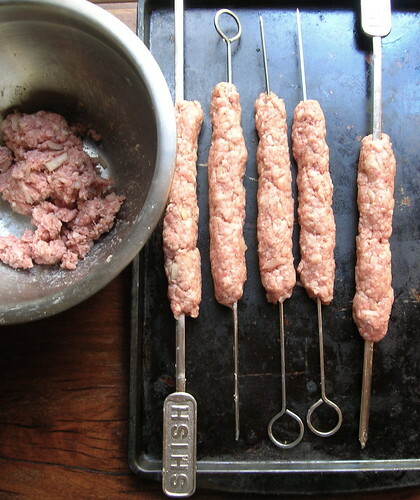 Kebab halabi, or Aleppo-style kebabs. Before we talk about those kebabs, however, it’s important to backtrack and talk about kebabs in general. How unfortunate is it that outside the Middle East people think of kebabs as chunks of things stuck on skewers, how drab, how boring, how limited. No, no, no, I always want to say, you are missing out on the best kebabs! You see, most often the favored kebabs are those made with ground meat. Both kinds of kebabs are available, the kind made with chunks of skewered meat are known as shish kebabs (from the Turkish sis) and the kind made with ground meat are called kefta or kofte kebabs. It is no wonder that kefta kebabs are the favorite kebabs because when you think about it they are really just like hamburgers only made into a different shape. The meat for these kebabs is most likely lean ground beef or lamb, and occasionally camel. The second key element of eating kebabs is presentation. You do not simply plop the kebab down on a plate all naked and alone. No! 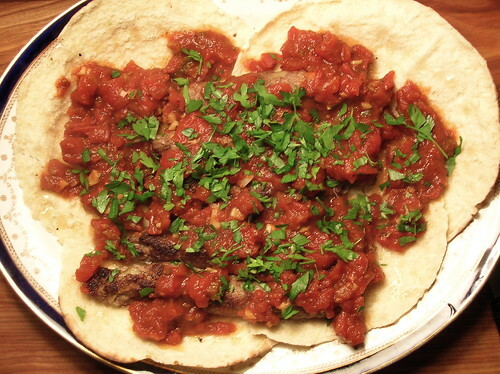 Kebabs are always placed over pita breads, which have often been rubbed with a little tomato paste, and then they are usually covered with more bread over top. Just like when you order a hamburger you expect a bun and some ketchup, when you order kebabs you expect it to be sandwiched with those tomato-rubbed flatbreads. And those breads which have absorbed the kebab juices, they’re my favorite part. At a kebab house, you’ll be presented with a variety of choices of kefta kebab. Most of the choices are named after geographical locations and refer to how the kebab will be seasoned, kebab Istambouli includes pine nuts in the meat mixture, while Izmirli includes cubes of cheese interspersed between the meat. I’ve always been rather fascinated by this, who, for example, decided that Anataklia was synonymous with eggplant or Anatbli with mushrooms? So what’s so special about those kebab halabi, the Aleppo-style ones? Well, the kebabs themselves have chopped parsley in them, but the best part is the spicy thick tomato sauce they come bathed in. Tongue-tinglingly spiced with the famous Aleppo pepper, that chunky tomato sauce transforms the kebabs into one of my favorite meals. All the time I’ve lived, worked, and studied in the Middle East, my mom has never come to visit me. She’s practically refused to travel to the region, preferring to send my uncle as an envoy. She’s heard a million stories, seen a plethora of my pictures, and knows more about daily life there more than most Americans, but traveling was never on her agenda. I made Aleppo-style kebabs for dinner together one night, and as we sat and I explained about all the kinds of kebabs, she said “you know, I think I might like to visit there one day.” Just as I said, never underestimate the power of a good kebab. While traditionally made with lean meat, I think it’s fine to make these kebabs with a fattier meat, like a shoulder cut of lamb, just make sure to keep an eye on the grill as any dripping fat can cause flare-ups. We make these all the time in the winter using the broiler as well. 1. Place all the kebob ingredients in a large bowl. Knead the mixture with your hands for 5-10 minutes. The mixture will change consistency and become quite sticky (the nature of the proteins in the meat have changed, which is what you want). Cover the mixture and refrigerate for at least half an hour. 2. Make tomato sauce: Heat the olive oil in a large pan. Add the sliced garlic and cook over low heat so that the garlic softens but does not brown. Add the tomato paste, stirring so that it lightly toasts, then add the chopped tomatoes. Season with salt, pepper, and sumac. Simmer the mixture for about 20 minutes until it forms a nice chunky-thick sauce. Taste for seasoning (it should be pleasantly spicy) then set aside. 3. Preheat a grill or broiler. Have the tomato sauce warm, but not piping hot. Using damp hands, form the kebabs around metal skewers (they may want to fall off at first, just work the meat mixture around the skewer with your hands until it is cohesive). Grill or broil the kebobs for 8-10 minutes, turning once. 4. Open up half the pita breads. Use the breads open-side up to line your serving platter. Slide the kebobs off their skewers onto the bread (if you used a broiler and there are some meat juices on the pan, pour them over the bread as well). Spread the tomato sauce over the kebabs. Sprinkle chopped parsley over the platter. Serve, making sure everyone gets some of the bread, kebab, and sauce, with extra pita bread alongside. i LOVE kebabs, but i must admit that i was oblivious about them for the longest time. yes, i was one of those goobers who thought anything on a skewer was a kebab. i finally went to an authentic turkish restaurant and got my facts straight. anyway, i appreciate your nice summary and awesome recipe! As always, one of your recipes happens along at just the right time. I share a birthday with my (Lebanese) mother-in-law which is this Saturday and I wanted to do something a little different. She has yet to make a positive comment on what I cook so hopefully "the power of kebab" will lend a hand! I don't do much meat either, but my Bosnian significant-other is constantly singing the praises of kebab (with pita and some form of yogurt, a la Bosnia). This post may have finally convinced me to give it a try! As always, a great recipe, with excellent results. Your middle eastern recipes are the best and so are the stories that accompany them. When I lived in Italy I lived on doner kebabs...so incredible. I read this yesterday and have actually been craving one ever since!! I'm going to try this recipe; it looks SO good. Ooooh, Yummy! I love Kebabs! It looks so good! Looks delicious. I also love kebads. Thanks for sharing. After living in Azerbaijan for four years, I was burned out on kebabs and lamb for that matter. But reading your blog has made me absolutely wish that I could run out and have one right now! The photos are yummy! Great post! Kebabs are fannnnntastic. I love your recipe (and your very interesting introduction) , I have posted on my blog a recipe of kebab too. I am finally writing to say that I LOVE these kebabs and make them all the time. With beef, with lamb, in the broiler, on the bbq -- they're always delicious. And also, this recipe is a hit with kids -- my ten month old can eat a terrifying amount of these.